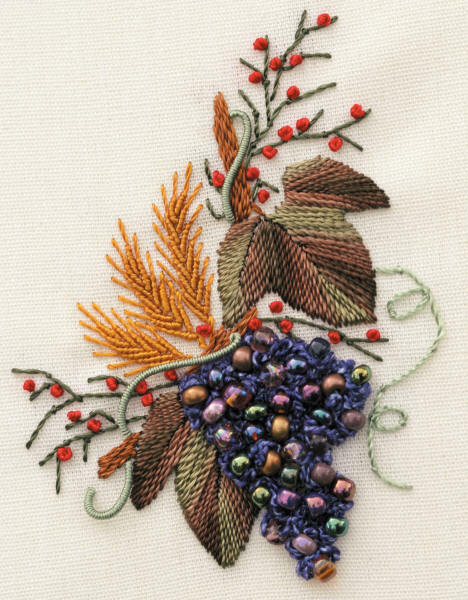 Grapes & Wheat Brazilian Dimensional Embroidery design: fabric, beads, instructions. EK5702 $9.00 Cream Fabric How many? Thread Heaven Bees Wax that works well on metallic, silks, and rayon threads. Enter your E-mail address and first name, last name into box and press Subscribe. Newsletters will not be sent out more than once a week. There will be sales and information for subscribers only. Brazilian Embroidery Starter Package $48.48 Value for $43.50 What's in my cart? ♥ What do I need to begin? Specializing in Brazilian Embroidery but providing stitchers with much more! Contact Us Ordering Information Shipping Fees Terms & Payments Back Orders/Special Orders Returns Where is JDR Brazilian Elegance?